This week’s OzComics.com challenge was Batman. How could I pass up this opportunity? I started sketching in the old drawing pad, searching for a look that I liked. Having come up with this angular design I then set upon the task of designing my version of the Batmobile and could think of no better car to base it on than the classic over the top ’80s supercar, the Lamborghini Countach. Being a rather angular shape already, it leant itself well to the ride of choice for this particular Dark Knight. Drive was not the movie that I though of aping at first. 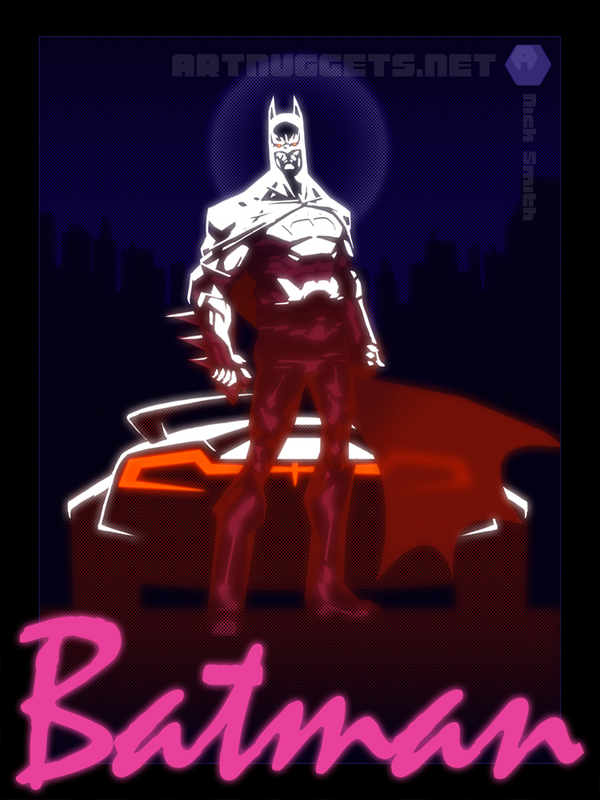 I did toy with the idea of doing a version of the Beverly Hills Cop cover with Batman sat casually on the bonnet of his motor. I was halfway through this one and on the brink of redesigning when the whole Drive thing sprang to mind, which was a relief. Having spent a lot of time on the Star Wars cover I was quite keen to keep this one to a more manageable timeframe. And because Drive is a cracking movie. 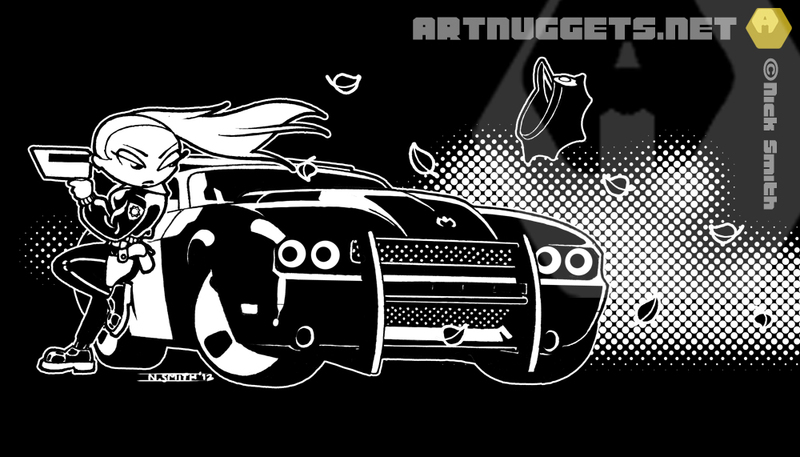 Part of the Wideguys lineup, I initially wanted to do a cop car conversion of the 2009 Dodge Challenger. This was one of the American muscle car re-imaginings I really liked from a few years ago, other examples of which are the Ford Mustang and Chevrolet Camaro. From there I developed the idea of it being part of a speed trap scene, and that it would be cool to have the cop a female, so that I could use her long hair to accentuate the draft created by the unseen perpetrator speeding by. The criminal in question was originally going to appear to the right, having gone round a bend left and driving off into the distance. Ultimately I preferred the idea that you don’t see him, just his wake. This image was created by drawing and inking the car and the cop separately with a pen and pad, then scanning and comping them in Photoshop. The dust cloud effect was created using the Colour Halftone filter. There is nothing between some of these. There are about five or six entries that could easily grace the cover of a Star Wars book. I’m not going to do a second and third as any of the ones I’m mentioning could easily be the winner. Have to acknowledge the brilliant work of Wade Gregory Clarke, Jan Filippelli, Dane Madgwick and… this too hard. A portrait done as a commission for a friend. 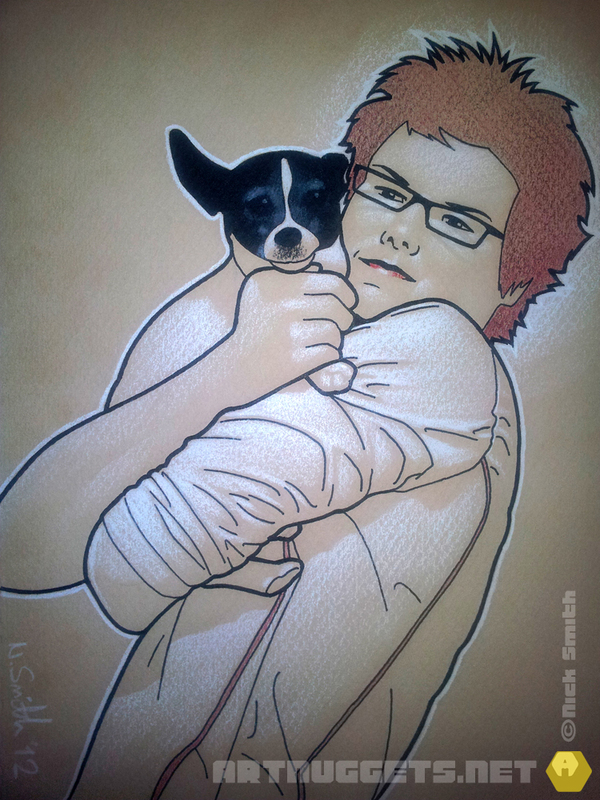 It took about four hours using coloured pencil and black PITT pen. The original photograph was a nice composition, which always helps. This is a tribute to our friends, drawers and comic-book creators from Wroclaw. A friend of mine commissioned me to do a digital painting of him playing rugby for Burnley RUFC in Lancashire, England. I was also instructed to have a couple of his mates in there as well, in support of his run to the try line. The whole job took me about 17 hours to do from scratch. I started with a sketch and proceeded to block in the characters with tones, having roughly gone over the outlines. I then went through and rendered each of the characters, before moving onto the sky, the grass and finally the background elements. After tidying up the characters once more, I flipped the image to check the balance and decided I preferred the image the other way round, with the characters coming towards the viewer from left to right, ending with the man of the moment looking back the other way as he hands off his would be tackler.